And with great power the apostles gave witness to the resurrection of the Lord Jesus. And great grace was upon them all - Acts 4:33. Do we make too much of the pagan and false religious links to words in respect of both Christmas and Easter? After all is said and done what do the historic derivations and definitions effectively contribute to the discussion? Surely in the final analysis it's the current meaning and perception that carry the day. The English “Easter” may indeed derive from “Estre” (“Eostre” a.k.a. “Eastre”), an Anglo-Saxon goddess of spring, but even if that is the case, which is by no means certain, does it automatically follow that Easter and/or the use of the term is “pagan” or that it turns us into pagans? In view of the fact that I have stirred up a hornet's nest of sorts I have decided to extend the debate by publishing “Celebrate Hanukkah: the Hanukkah ~ Christmas Connection” (see pp 5) in the hope that the Jewish extremists will carefully consider the view taken by conservative Jewish scholars such as Arnold Fructenbaum and Jacob Prasch on these matters. In saying that I am not inferring that either of the two named do in fact agree with all that we have published on the issue. They do however acknowledge the legitimacy of gentile Christian festivals just as we at CWM agree that Jewish festivals are legitimate for Israelis, so long as neither imposes an obligation on the other. My point has always been that we should use any and every opportunity to witness to our Christian faith. That's what the early Christians did in adopting and adapting pagan feasts and holidays. I think there are no better seasons to do that than Christmas (Hanukkah) and Easter (Passover). Moreover, brethren, I declare to you the gospel which I preached to you, which also you received and in which you stand, by which also you are saved, if you hold fast that word which I preached to you—unless you believed in vain. For I delivered to you first of all that which I also received: that Christ died for our sins according to the Scriptures, and that He was buried, and that He rose again the third day according to the Scriptures, and that He was seen … - 1 Corinthians 15: 1-5. What an opportunity in the midst of all the commercialism and false ideas about Easter to witness to the fact that it is a festival when Christians celebrate the Resurrection of the Lord Jesus Christ and to thus share the Gospel with non-Christians. 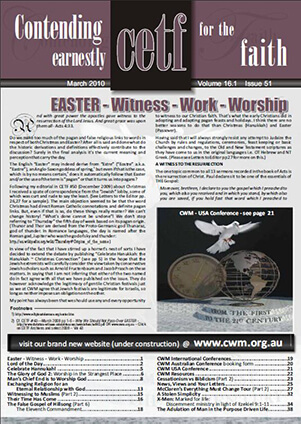 As Christians we rightly criticise Jehovah Witnesses (JWs) for their works based activity (see next CETF #52 about Witnessing to Jehovah Witnesses). As I write this editorial, God willing my wife Kathleen and I are just eight days away from starting our Mission to Asia. What a joy it will be to share worship with various nationalities—Chinese, Malays, Indians, Bengalis and the many ethnic groups who call Singapore home. By the time you receive this issue of CETF the tour will be over. God willing CETF #52 will feature various reports about our visit from the countries where we have ministered. Please watch for it. It should be an exciting issue. As with Christmas so with Easter – Jesus is the Reason for the Season! with His saints to reign.